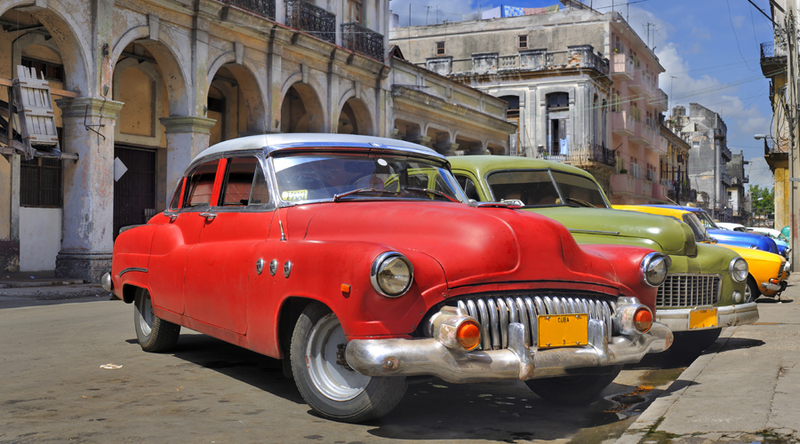 What is it about Cars and Cuba? If you want to take a step back in automotive time, then you have to go to Cuba. Havana is a beautiful city in itself, with its brightly coloured, dilapidated buildings and bustling streets, but there is nothing quite as beautiful as seeing a never ending procession of classic cars cruising the streets, like it’s Miami in the ’50’s. Cuba is literally a living car museum. Everywhere you look you will see 1950’s American Classics, from Oldsmobile to Chevrolet, Buick to Ford with a nice sampling of Chrysler’s old Plymouth brand. Some of them are immaculate, some of them a bit time-worn and you might even find a few Russian Volgas driving around, although these are incredibly bland by comparison. This all came about because of the embargo against anything and everything American which was put in place by the country’s leader, Fidel Castro, after the Revolution in 1959. All vehicle imports were banned, including spares so all these cars have been lovingly cared for by using and re-using any spares and hand-made, improvised parts. Quite amazing when you consider that the island is only a mere 80 miles away from Florida. American auto enthusiasts would love to get their hands on some of these beauties and would be prepared to splash hundreds of thousands of dollars on cars that are everyday vehicles in Havana. One day, no doubt, they will. Change is coming to Cuba and with it so much of the character of this magical Island will disappear. The ban on foreign import cars has been lifted so Cuban consumers can now purchase modern vehicles … if they can afford to pay for them. Great news for some, but can you really imagine what the streets of Cuba will be like when these magnificent vehicles have gone?